Wreaths are expensive! It took me too years to bravely purchase one. What I should have done was put my mind and knuckles to it and make my own! I'm sure my kids would not mind that sort of thing, but that part of me is afraid to come out. I fear I'll fail flat or just make the ugliest thing possible! Anyway this is why I'm sharing this gorgeous creativity from Home Made Serenity. Look at the wreath she made with her family! Seriously I have good envy. Go check out her egg carton wreath tutorial and see yourself inspired. 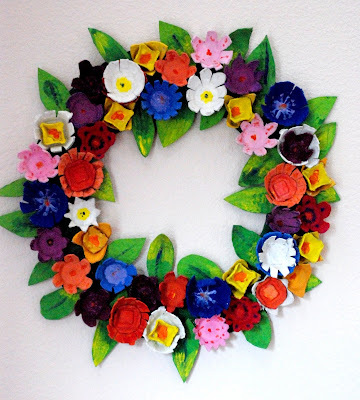 Have you ever made your own wreath? Do you prefer making your own over store bought? I have good envy too of people who are creative but I purchase those creative people's work LOL I tell myself I am doing my part by buying their hardwork, LOL. Sometimes, I just buy plain garland wreaths and adorn them with a simple red ribbon and maybe a pine cone, that I can handle but those I have to pitch. I passed on the Versatile Blogger Award to you, drop by and get it! !